We have detailed how the N. American plate is put under pressure during the Earth Torque. Put one hand on New England and twist it East (during the daily rotation of the Earth) but hold Mexico back, pulling back toward the West (as the magnetic S Pole of Earth is tugged back by the grip of Planet X). What does this do to the N. American plate? It pulls it at a diagonal, ripping the rock fingers along the New Madrid fault such that the land to the East of the Mississippi moves up and to the East, toward New England, and the land to the West of the Mississippi moves down and to the West. This does more than tear most of the bridges along the Mississippi, it weakens the land to the West of the Mississippi, causing it to drop. The land to the East of the Mississippi is rock, the bluffs of Memphis and underlying rock where the Appalachian Mountains curl through Tennessee and Alabama toward the Mississippi river. But the land south of the Ozarks is not solid rock, and when stretched will drop in elevation. This is already occurring. What is the relationship between quake swarms in Oklahoma, sinkholes in Missouri, and a water tree in Texas? The rock underlying this area is being stretched, fingers pulling apart so support of the ground is lacking, and the ground sinks. As we have stated, stretch zones do not experience large quakes, but the trauma is just as great as in compression areas. Thus, the fact that this stretching and sinking is occurring is missed until something dramatic occurs to hit the news. 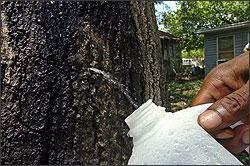 What has caused an oak tree in the middle of a drought area to ooze water? What happens to water under pressure? It seeks to escape, moving up when that is the only avenue it can move. Tidal bore, where water rushes up a ravine well above sea level because the pressure from the sea behind the tide is intense, shows this to be the case. Water spews above ground when geysers blow because of pressure, alone. Stretch zones experience a release of pressure in places where the rock fingers slip apart, but there are likewise areas where pressure is increased. For the N American plate, to the West of the Mississippi, land released from its attachment to the Eastern land springs West, causing pressure toward the West. Water in aquifers react to this quickly, along the entire area affected by the aquifer.